Look like a hoot and I'm in next range visit. Aah...What ARE you talkin' about? Oh look! Something shiny in the corner! You haver something in that small of a caliber or will you have to lower yerself to borrow a .22 rim fire? That's my dime in the corner!! Leave it be!! Got 2 in 22lr. Rifle and pistol. Er aint ya been paying attn. Race ya to the corner!!! You two are a hoot! I love the sense of humour that people in here have...the daily laugh helps keep me sane....or is that insane, can't really remember. But whichever...its awesome. 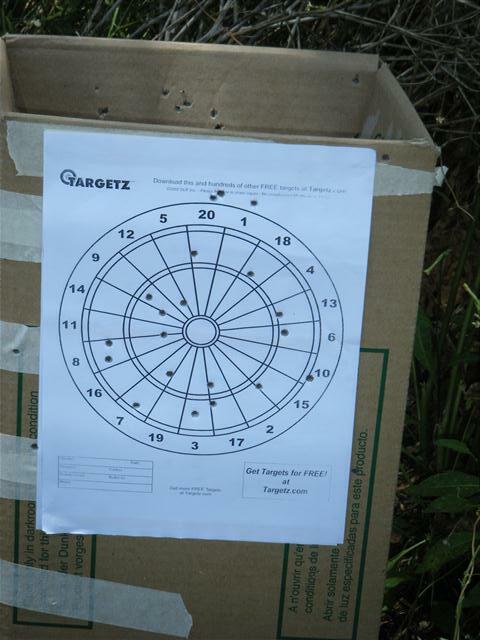 here is my entry, better late than never..
22 magnum at 50 meters off hand shoot. maybe next time I'll bring my bench. Where's the one in the middle? Still workin' on mine. I'll post it when I'm a little happier with it. Right now I look worse the Gelandangan's target. gelandangan, good on you for keeping this thread going. I still have a clean target sitting in back of my car waiting for my 10-22 mods to get finished. Or maybe my .45-70 to get finished!